The value-oriented Protekt™ Aire 3000 is an ideal mattress system for a provider with a limited budget that won't sacrifice quality. 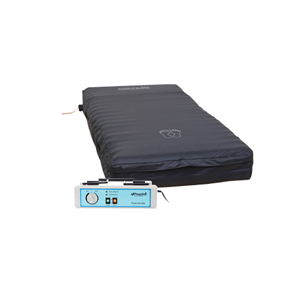 The Protekt™ Aire 3000 combines dual therapies of low air loss and alternating pressure in one unit. The durable, powerful yet quiet user friendly pump is designed to treat pressure ulcers stages I-IV. The Protekt™ Aire 3000 mattress has 20 individual bladders that allow for deep submersion and excellent pressure redistribution. The Protekt™ Aire 3000 pump alternates in 10-minutes intervals and the adjustable air flow dial provides custom pressure settings for each patient's individual requirements. Air flow dial to obtain custom patient comfort and pressure levels.